The first and only wellness and conference hotel of Zsambek, the 4-star Szepia Bio & Art Hotel awaits its guests in the picturesque Zsambek basin only 30 km far from Budapest. The hotel pays special attention to recreation, so it is popular among those who live healthy life and who like active holidays. Szepia Bio Art Hotel offers an own wellness department, air conditioned rooms with bio rooms among them and conference rooms which are ideal places for corporate events, trainings and banquets. 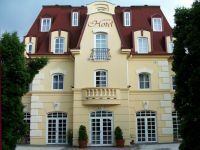 Fodor Hotel Fishermen’s Inn*** is located in the centre of Gyula, near the Castle Spa of the city. The medicinal waters of the spa have curative effects for locomotor disorders and nervous complaints. Our child- and pet friendly hotel offers the best accommodation solution for families, large groups, as well as for individuals. In the Fishermen’s Inn guests can enjoy our fish-specialities and a variety of local cuisine. Hotel Nefelejcs *** is located in Mezokovesd, about 150 m far from Zsory Spa, the famous thermal bath of the city. In the wellness area of Hotel Nefelejcs guests can enjoy the bubble bath, the Finnish and infra saunas. For the complete renewal guests can take traditional Indian medical treatments and medical massages. The modernly equipped conference room is an excellent place of event for conferences, trainings and other event types as well. 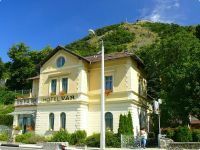 The 3-star VAR Hotel Wellness and Castle Hotel is located in the historical centre of Visegrad, directly on the Danube bank, near the Castle of Visegrad. Hotel Var offers 20 comfortable, tastefully designed rooms with free WiFi Internet connection and a restaurant. The wellness centre of the hotel provides relaxing wellness services. Guests arriving by car can park their vehicle in the hotel’s own closed parking space. 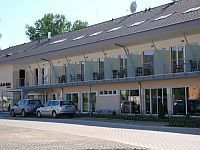 Barack Thermal Hotel and Spa is located in small riverside town, in the beautiful environment of Tiszakécske, just 100 meter far from the Tisza river. Beside the usual double rooms, we also offer family rooms, suites and rooms accessible for our disables guests. The thermalbath can be easily reached from our hotel through a passageway. In the thermalbaths of Tiszakécske many spa and leisure pools are available and beside these we also offer different types of sauna. The hotel emphasises on the perfect attandance of guests following a healthy livestyle. Therefor nutrition, detoxification, stress reduction, life-giving water, fresh air and exercises are offered our guests to fulfill their needs and healthy livestyle. The air conditioner and the WI-FI is available in the whole building. Hotel Millennium is situated in the downtown of Pecs, on Kalvaria hill. The 4-star hotel awaits its guests with tastefully furnished, air conditioned rooms, wellness services, Internet access and an underground garage. Thanks to its location, guests of Hotel Millenium can easily reach the World Heritage Sites of Pecs – it is an ideal starting point of sightseeing trips. Hotel Vital **** awaits its guests in Zalakaros, in a silent environment. The wellness hotel offers 30 renewed, non-smoking, air conditioned rooms and apartments, Hungarian and international food and drink specialities and a wellness department with a surface of 600 qm that offers perfect recreation for everyone. The four-star, child-friendly Royal Club Hotel **** awaits its guests in Visegrad offering homely atmosphere, helpful staff and child-friendly facilities. Thanks to its air conditioned, non smoking rooms and apartments, its child-friendly wellness department and to the surrounding area, the wellness hotel offers the perfect place for rest, relaxation, and recreation. The 4-star Grand Hotel Glorius, the newest design hotel of Makó, is located opposite to the Hagymatikum of Makó. Elegant restaurant reminiscent of the 20’s, excellent wellness section and air-conditioned rooms await the guests. In addition to the traditional double rooms, superior corner rooms and superior honeymoon suites are at guests' disposal. Next to the gastronomic masterpieces of Glorius Restaurant, guests are also given the chance to taste wines. For the guests of the hotel free WiFi and parking spaces are provided. 3-star Hotel Bestline awaits its guests in the building of former Hotel Frankfurt in Budapest. Because of its location Hotel Bestline can serve as an ideal destination for through-passengers, guests who are in need of some rest after long hours of driving or for the ones who would like to spend some pleasant nights. In the hotel there are 86 air-conditoned rooms from single rooms to four-bed rooms. Wireless Internet is available for free both in the rooms and the in common areas. The pleasant small Hotel Familia with family atmosphere awaits its guests in Balatonboglar, directly on the shore of Lake Balaton. The hotel offers 63 rooms with balcony, own beach and a restaurant looking onto the lake. Free WiFi Internet connection and parking places are provided for the guests of the hotel. 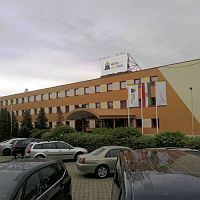 The 3-star Hotel Szieszta of Sopron, situated close to the western border of Hungary, offers sub-alpine air and friendly services. Fitness centre, tennis courts and other sport facilities awaits the guests who like active holidays. The Wellness Hotel Panorama Hotel Noszvaj is located in Noszvaj, in Northern Hungary hiding in a pine-forest. The wellness hotel welcomes its guests with 45 modern, air conditioned rooms, a restaurant and a fitness-wellness section. Have a pleasant stay and enjoy the comfort and the atmosphere of our hotel in Noszvaj! Hotel Auris was opened in the heart of Szeged in 2015, only few minutes from the bank of river Tisza and from the Dom square. The brand new hotel offers 27 modern, air conditioned rooms, a restaurant for 70 persons, a conference room and closed car park for guests arriving by car. Tündérkert Hotel and Conference Center opened its gates in Noszvaj at the beginning of 2016. Tündérkert Hotel awaits its guests with 30 rooms constructed and decorated in vintage style and 6 romantic mini suites. The hotel is a perfect place for both family and business travellers. Tündérkert Hotel is a true child-friendly accommodation, where, a unique variety of quality programs is offered even for the smallest members of the family. Elixír Medical & Wellness Hotel Mórahalom Elixir Medical Wellness Hotel is located in Morahalom, only 20 kms from Szeged. The new 3-star hotel is directly connected to the Szt. Erzsebet Medicinal Spa. Hotel Elixir offers 29 air conditioned rooms, a restaurant and an own health center with treatment rooms, a therapy pool and saunas. The wellness hotel combines the modern medicine and wellness services.